It said it had noticed problems arising from icing on the monitors last year and had begun changing them in April. There has been speculation that faulty data on the old-type sensors may have caused the crash of the Rio de Janeiro-Paris flight with 228 people on board. Brazil says two bodies from the missing plane have been recovered. Items - including a case with a ticket for the flight - were also picked up on Saturday - some 800km (500 miles) north-east of Brazil's Fernando de Noronha islands where the AF Flight 447 disappeared in turbulent weather. Investigators say that sensors on board the missing Airbus 330 were providing "inconsistent data" in the minutes before it went missing. On Saturday, Air France said that in May 2008 it had begun noticing "incidents of loss of airspeed information during cruise flight" on its A330s and A340s jets - although only a "small number" of incidents had been reported. The airline said it then contacted Airbus, who sent a recommendation to replace the monitors. However, Air France stressed that the manufacturers had not made this a safety requirement. 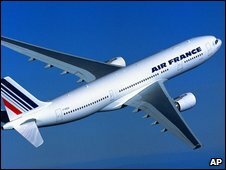 The statement said that "without prejudging a link with the causes of the accident, Air France has accelerated this [replacement]programme". It added that this did not necessarily mean the aircraft was not safe to fly. French investigators also warned against drawing early conclusions. The statement came as the Brazilian air force announced that two male bodies and debris from the Air France plane had been recovered. Air force spokesman Jorge Amaral said objects linked to passengers known to be on the flight were also found. Those included a suitcase with an Air France ticket and a backpack with a computer inside. "It was confirmed with Air France that the ticket number corresponds to a passenger on the flight," Col Amaral said. A blue seat was also found, and Air France is checking the serial number to see whether it came from the flight. The remains were found not far from where the last signal from the plane was received, and taken to the islands of Fernando de Noronha. Experts on human remains are on their way to examine the find. The items were the first to be definitely linked to the plane, nearly six days after the crash. But the BBC's Gary Duffy in Sao Paulo says the authorities are adopting a cautious approach after previous reports of debris being found proved false. Correspondents say that much of the search effort so far has been focused on finding flight data recorders, which have sonar beacons - or "pingers" - attached to them. But French officials say there was no guarantee the beacons were still attached to the flight recorders, and they may have been separated in the impact of the crash. A French submarine is being sent to join in the search. It has sonar equipment that could help locate the airliner's flight data recorders. The US is also sending specialised listening equipment.